The core of the navigational systems is a Furuno NavNet 3D multifunction plotter. New Morning has an 8” unit (aka MFD/8) which pops up out of a box on the left side of the companionway. I had originally planned to have a second unit at the starboard helm, but the unit under the dodger turned out to be clearly visible from the helm. Furuno FI-50 displays in the cockpit, aft cabin, nav station and forward cabin, and a Maretron DSM250 at the nav station, also display NMEA 2000 network data. All of the Furuno navigation equipment is tightly integrated with MaxSea Time Zero. The MFD/8 can even use the MaxSea charts which are located on the iMac. 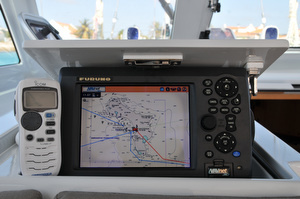 A Furuno GP32 is the primary backup GPS. Before departing on a passage I load all critical waypoints into the GP32 and generally use it at the nav station to monitor our miles completed, miles remaining and ETA. The GP32 is also wired, via NMEA 183, to the iMac so that if the MFD/8 were to fail we can use MaxSea as our primary plotter. The secondary backup GPS is a Garmin GPSMap 76CSx. It is also loaded with charts and can be our primary electronic navigation if necessary. Our non-electronic forms of navigation include the paper charts which we carry for each of our planned navigational areas, including both planning charts and harbor charts. And of course the final non-electronic navigational aids are the Suunto F-135K compasses positioned in front of each wheel.